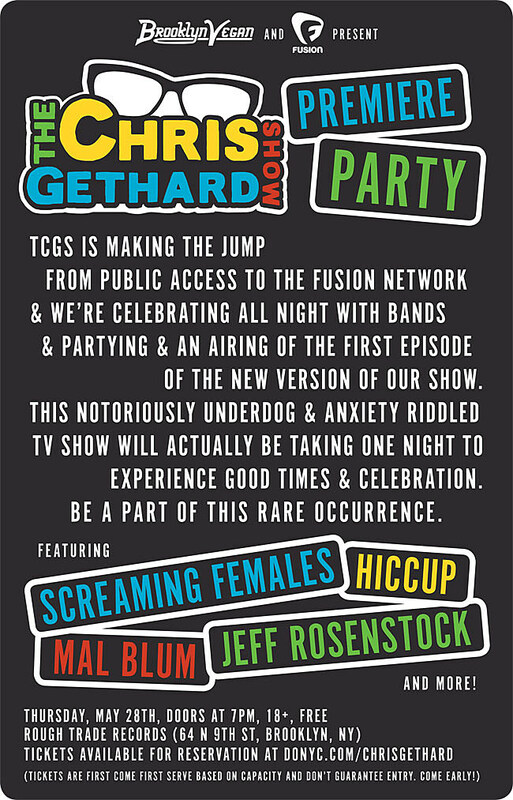 BrooklynVegan is excited to be presenting this show, which is the premiere party for comedian Chris Gethard’s debut on cable TV. HIs show, formerly on public access, will now be on cable network Fusion, and at Rough Trade tonight the first episode will be screened. Additionally there’s music from his talented friends, including NJ shredders Screaming Females, Bomb the Music Industry frontman-turned-solo artist Jeff Rosenstock, singer/songwriter Mal Blum, and Hiccup who include Unlovables singer Hallie Bulliet, who’s also a member of The Chris Gethard Show‘s house band. To get in you needed to RSVP (which is now closed), but even with RSVP admission is first come, first served. Get there early! While people wait for the Royal Trux reunion that’s happening this August (and so far only in LA), you can catch one half the band, Neil Hagerty, tonight with likeminded noisemakers PC Worship and long-running CT-based band Sore Eros. The JSBX ran through the better part of NYC not too long ago as part of their whirlwind Five Borough Freedom Tour and now they’re back as part of their proper tour supporting their terrific new LP, Freedom Tower – No Wave Dance Party 2015. It’s opening night of NYC Popfest, featuring a host of jangly goodness, including the Prefab Sprout-loving Roman a Clef, Baltimore’s shoegazey Wildhoney, power-poppers EZTV and headliners Beverly. Keeping things flowing in between sets will be BV editor Bill Pearis on DJ duty. While it’s not quite the same without Kim Deal, Pixies continue on, delivering the hits. If you’re going to this show, we highly recommend you get there for opener John Grant, whose funny, sad songs and and magnetic stage presences is not to be missed. Last week, Montreal’s Patrick Watson released his newest album, Lost Songs for Robots (via Domino), which is a lushly arranged chamber pop album and a very good one. Tonight’s his first of two NYC shows on his tour supporting it (the second one is in December), and indie folk band The Low Anthem opens. Worriers, the current band of former The Measure [sa] singer Lauren Denitzio, are preparing to release their new Laura Jane Grace-produced album on Don Giovanni, and from the sounds of first single “They / Them / Theirs,” it’s looking like it’s gonna be pretty great. Also on tonight’s bill is their British tourmates Caves, Richmond’s ’90s-style indie rockers Sundials, and another DG band, Alice. The very talented Scottish producer Hudson Mohawke has made beats for Kanye West, worked as one half of TNGHT, and is also a worthy solo artist. For the first time ever, he’s put together a live band to perform his music, and the debut of that live show is tonight. Electronic wiz Daedelus last released his The Light Brigade LP on Brainfeeder in late 2014, and tonight he returns to NYC in continued support of it. James Holden still hasn’t released a followup to 2013’s great IDM opus, The Inheritors (given that followed his 2006 debut, it may be a while), but with singles dating back to 2000, he’s got no lack of worthy material to pull from in tonight’s live set. As a live act, electronic musician Bonobo has gotten pretty huge, headlining big places like Central Park and Terminal 5. Tonight he’s in DJ mode, but will surely still get the party going. Jack & Eliza make charming ’60s-inspired pop with hints of Ricky Nelson or The Everly Brothers, or even a bit like early Slow Club. Their debut album, Gentle Warnings, is out June 9. Brazil’s Marcos Valle has had a long career, stretching back to the ’60s. But he may be best known now for his 1982 single “Estrellar” which was used in a Southern Comfort ad shown a lot during last year’s World Cup telecasts. Fans of samba, bossa nova, jazz, disco and kitschy fun take note — he’s at Birdland through Saturday. Toronto band Grounders take a traditional ’60s pop sensibility and fry it till golden brown, glistening and modern. Celebrating the new wave icons’ classic 1980 album Freedom of Choice — as well as the new 33 1/3 book on it — tonight features Evie Nagy, Fort Lean, Jake Fogelnest, Dave Hill, Sara Benincasa, Liam McEneaney, and Joe Garden. Unfortunately original Devo member Gerard Casale had to cancel his appearance. Best known for his 1982 hit “Someday Someway,” Marshall Crenshaw has had a long carreer as a pop songwriter with a deep catalog of super catchy songs. For your daily dose of both noise rock and metal, tonight’s show with Portland, OR’s Wizard Rifle is the place to be. They cite both Lightning Bolt and High on Fire as influences, and it’s not hard to see why. Slim Cessna and crew have been making gothic alt-country for over 20 years, as they recently chronicled in their new An Introduction for Young and Old Europe compilation. Tonight’s their first of two NYC shows on this tour.